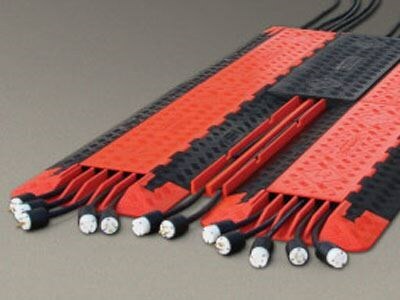 Cross-Link Protector Bridges are designed to utilize the space between multiple parallel cable protector runs. These bridges provide additional cable channels while providing a continuous, level crossing surface for vehicle and pedestrian traffic. Cross-Guard ADA Compliant Ramps and Rails can also be used in conjunction with protector bridges to provide a gentle slope and safe crossing point over multiple cable runs for wheelchairs, carts, road cases, and vehicles with small wheels.